DEBORAH CROMBIE: I'm going to beg your indulgence, dear REDS and readers, in the midst of our THRILLER FORTNIGHT, for a spot of personal indulgence. This was a milestone week for me. One of many, yes, but still... On Monday night, I typed THE END on the 510th page of my 15th novel. (Like the little reverse number thingy, there?) I'd been working on this book for...well, longer than I should have. More than a year, which is not, unfortunately, unusual for me. Of course, most writers whoop and shout with jubilation when they finally, finally get to type, or write, those words. There are all the desperately practical reasons to be glad you've reached the end of a novel--deadline pressure, publication schedules, the absence of any sort of normal personal life for weeks--or months--as we spend our days and nights chained to the keyboard. There's just plain physical exhaustion, and the little matter of bread and butter--most of us write to eat. So celebration is more than due, and it can make us a little giddy. But there is always, for me, buried in the relief, a twinge of sadness. Mourning, even. The book is not really finished--there are still what my English literature professor friend calls "the grubby details"--revision, copy edits, page proofs--so we know we'll be going back to it again and again, tweaking and fixing. But you are never IN the story, living your characters, in quite the same way. You know how, as readers, you hate to get to the end of a book you really, really love? Even though you know you'll read it again, and you'll appreciate it in ways you didn't the first time, you hate letting go of that first total immersion in the story. That's a little like finishing a book feels to me. The solution, of course, if obvious. Sit down and start the next one. Sounds like this was a story you loved, Deb. I bet we all will, too! Big congrats (not apologizing for double exclamations)!! 510 pages...wow, we are on our knees in front of you Debs! It makes total sense that you'd be feeling blue after delivering that opus. But we will be so glad to read it! Congrats to writing "the end." I think the feeling is normal because when I finish a book it's like I don't want to go yet, but then I look at my pile and get to go on another adventure. Congratulations, Deb! I can't wait to read it. I agree with you. I never live the book in the same way as during the first draft. So, always, a little grief accompanies the relief and joy. But you have to lose that deep immersion in the book for it to make its way into the world and all its eager readers. It's like giving birth. That child will never be a part of you like it was again, but there will be all the joys of watching it grow and go out into the world. You've just got a little book post-partum depression! Congratulations, Deb! Not only for finishing another book but for all the blog posts along the way. You Reds are so consistent--I think that's what makes this such a great group blog. Yes, Linda, a bit of post-partum... Maybe everyone feels that way after finishing a huge project that they've worked on for a long time. The book, by the way, is already in the William Morrow Winter catalog, pub date Feb 19, 2013, and it's called THE SOUND OF BROKEN GLASS. And I think, once I've had a couple more days to recover, that I'll really like it! Oh, yes--the phantom book syndrome! You'll let us know, of course, when THE SOUND OF BREAKING GLASS is ready for pre-order? Also, maybe we can do an interview for my blog as the pub date approaches. On a sort of related note, I learned about a project on Twitter called #TagItTuesday, encouraging folks to help out their fave authors by clicking LIKE next to each of their books on Amazon and going down the page to the tags and agreeing with them. So, of course, I started with Reds. To my horror, I found some nasty folks have been tagging some of the Reds books with other authors' names and books and, worse, with tags like "Kindle too expensive." I couldn't find out how to remove any of those bad tags, so I just put better tags on, hoping they would show rather than the others. I encourage all you other JRW fans to go do this. Also, Reds, as the authors, you might be able to get these tags removed. If not, we just need to overwhelm them with the good ones. From the perspective of the reader: I frequently reread books that I love. There are some that I have practically memorized because I have reread them so often. When I am rereading and I have just one or two chapters left to reread,I will often put the book down for a few days because I do not want it to end again. I'm already missing the characters whom I have come to love. Even if I know that there's another book coming from that author, I will be missing those characters. Sometimes I dream about the characters, because they have become so real for me. (I might be the tiniest bit addicted to reading!) So I imagine that for you authors who have created these people it IS like sending your children out into the world, as Linda said. And Linda, right now I am one chapter away from my second reading of Every Last Secret. I have not picked it up since Tuesday or Wednesday because I'm not willing to say goodbye again for the second time. I will be waiting very impatiently for the next book! By the way,your characters are some of the people who have made appearances in my dreams. Even my subconscious worries about Brian - must be that the author made that youngster very real! The other book I'm rereading right now is Rosemary's Slugfest. Fortunately, I'm not quite halfway through it at ths point! If you are reading this,Rosemary, I'm desperate to read more about Paula! Deb, your most recent book is one that I plan to reread soon and I can't wait for whatever will come next! DebR, you are the sweetest! The next book, EVERY BROKEN TRUST, is out of my hands and in production. It's in the St. Martin's Spring Catalog. I'm off comments now. Have to flee my house for better air conditioning. Supposed to hit 107-108 degrees today, so I won't be back online till much later. What global warming? Oh, Deb, congratulations. 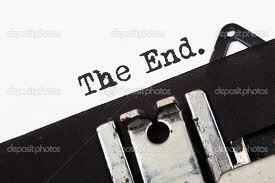 I've long maintained that for a writer, the sweetest phrase in the English language is "The End." My due date is July 26th. I will be SO glad to be able to do some fun summer things with my family instead of chaining myself day and night to the laptop. As a reader I hate coming to the end of a book I love. Hate it. And if it's a really, really good book then it makes it almost impossible to like the next book I pick up. I seem to resent ending my time in that particular world. I will often just read it again immediately. The first time I tend to read fairly quickly to see what happens. The second time I allow myself the pleasure of savoring and feeling each lovely phrase and the mood it conveys. Being the selfish wench that I am, must say I am ecstatic that there will be a new Deborah Crombie book out in February! Yay!!!!!! and in case I haven't said it before, Thank you, Debs, for all the joy you've brought me with your books. I hope for many more years of your talent. And thank you, Kaye, dear! I do know exactly how you feel about finishing books. My much-anticipated post-book treat was book just out in the UK, the third in a series by Ben Aaronovitch. But I finished it in two days! Waaaah! And Lucy, thanks, although this book was at least fifty pages shorter than the last two, and all I have to say to that is, "Thank God." You're my idol! Mojitos all around the Crombie household. Also impressed that Julia is cahined to her typewriter. Obviously I'm the lazy slug in this garden. Worked in the garden, watched tennis and will go tagsale shopping before i sit down to write today. And oh yeah...the Yankees are beating, oh I mean playing, the Red Sox in a doubleheader today. I'll write later..
...forgot to mention that's why those girls have written so many more books than I have! I'm always so relieved to type THE END that I don't feel sadness. Also I know I've got to go through the whole thing again to edit and polish. I always do a happy dance on the day it's sent to my editor. But as a reader I'm devastated when I come to the end of a good book. 510 pages, Deb. That is what you'd truly call a Big Book. I've never managed more than 400. Julia, that's just a couple more weeks! We are giving you a huge virtual REDS boost!!! You can do it, girl! I'd like to chime in with the other comment on what a joy this group is to so many fellow writers/readers in the crime community! You pull together so well and so in unison - you make us all feel we are part of your lovely, talented community! Thelma Straw in Hott Manhotten!! 510 pages? Wow! Good for you. When I finish a book it's generally with a huge sigh of relief. I'm amazed by the talent you all have. The ability to create characters and stories that are absolutely enthralling! Congratulations, Deb. And I'm re-reading the entire series to get ready for February. Oh, thank you! I'm glad someone else does this as well. I noticed myself grieving not only when I finished my novel, A Class on Murder, but also in the weeks preceeding its publication. Fear? Anxiety? It finally hit me that it felt like I was mourning the loss of my "baby." It would probably would have been easier to let my book go if it had acted like my real teenagers---rolling their eyes, acting like that would like to be anywhere else, and the general mouthing off!